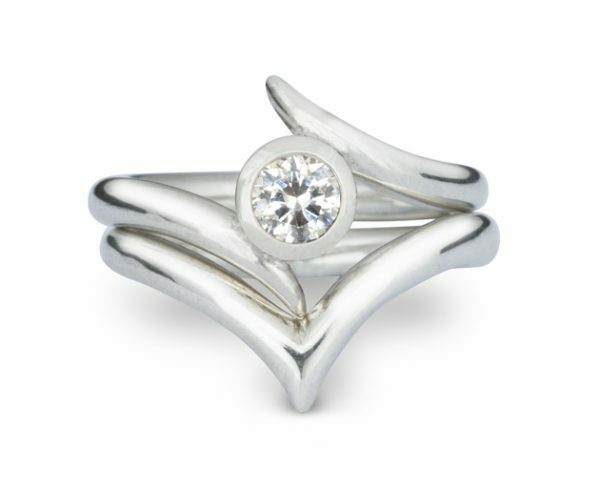 This beautiful & unusual handmade engagement ring is pictured made in platinum and set with a 0.5ct Fvs GIA certified diamond. The bespoke wishbone wedding ring can also be made to fit the other rings in the “outwards spiky” range: The triple outwards spiky engagement ring and the new spiky swirl bespoke engagement ring. These rings are available in other metals, with diamond sizes to meet most budgets and with alternative coloured gemstones. Handmade in our workshop on the crossroads in Ditchling, East Sussex.